Before I begin this project, I would like to reiterate that although I’ve been designing and building furniture for a period longer than thirty years, I am self taught. For years I had hoped that eventully a true aficionado of woodworking would see the true worth of Dowelmax and take up the banner. I was somewhat naïve and did not take into account the special interest groups, major manufacturers with unlimited advertising budgets, and magazines with “agendas”! Three professionals did take an interest, all Canadian; John Sillaots, Benoit Bissonette and Michael Kampen. I actually did a TV show with John Sillaots which helped in the short term. Hence my reason for the new project section on the website. 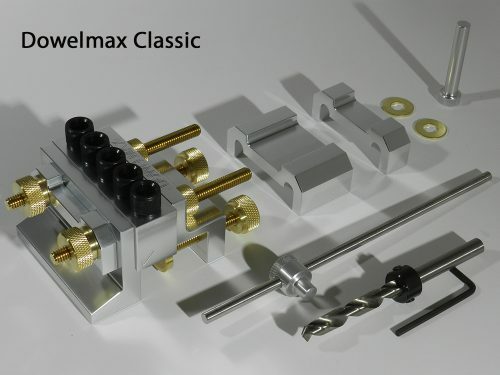 The main thrust is to convey the message that Dowelmax is a professional tool, and not a “gadget”. In taking on a large robust item like a workbench, or building the most stressed piece of furniture, viz. a chair, I can prove at least to most people that in joining wood with the multiple dowel arrangement, you can achieve the strongest and most accurate joint there is. I decided to incorporate turned legs at the front, however as I see it there are four options, i.e. 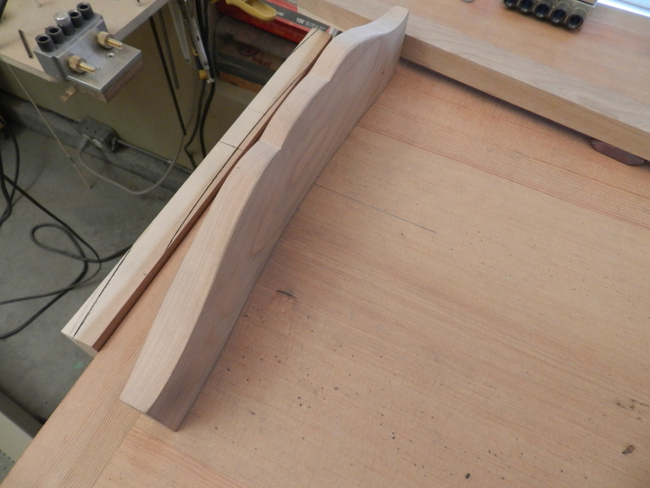 (1) straight 1 ¾ x 1 ¾ (2) curved lower profile as in end and hall table (3) cabriole as in photo, or (4) turned. Option (3) is shaped from a solid 4” x 4” section, using a band saw and pre-shaped templates. 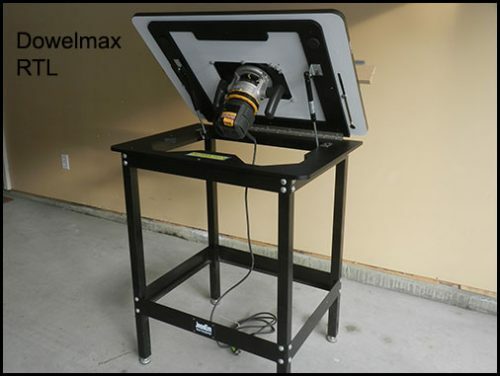 Router or Radial Arm Saw; Always follow manufacturers safety guidelines when using these, or any other tools. *TIP* If attempting option (3) at least 4 cuts are necessary in the band saw. When approaching the end of each cut, do not complete the cut, leave it partially intact. That way, when rotating the 4 x 4, a solid base is left to stabilize the work piece for the next cut. I almost never use drawings or plans, so before turning the first leg, and to ensure the proportions are correct, I sketched the rough profile on the face. Basically there are 4 sections, two turned and two rectangular. From the bottom these sections measure 3”, 3”, 7”, 4”. At the extremity of each turned section I scribe a line at each face using a set square. Then using a fine toothed saw, I cut into each penciled line. This helps to reduce chip out at these corners when turning. The first operation is to gouge the two cylindrical sections i.e. the bottom 3” section and the mid 7” section. I use either a parting tool or skew, again at each pencil line, this reduces the chance of chipping the corners. 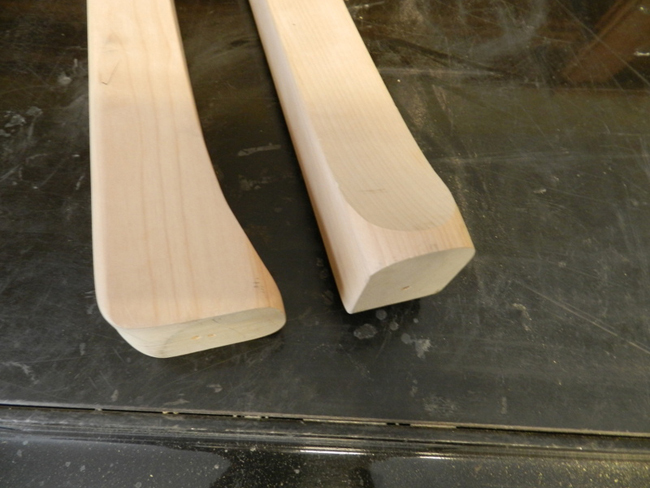 Then I used the gouge to round off these two sections. Pencil mark the various salient points of your design, switch on the lathe and complete the line around the circumference. Now complete your design using a calliper to ensure the diameters on both legs are similar. For new craftsmen, don’t be intimidated by the wood lathe or turning. Be safety conscious and wear eye protection. I honestly believe that with respect to this particular turned design, it is one of the most straight forward tasks in woodworking. 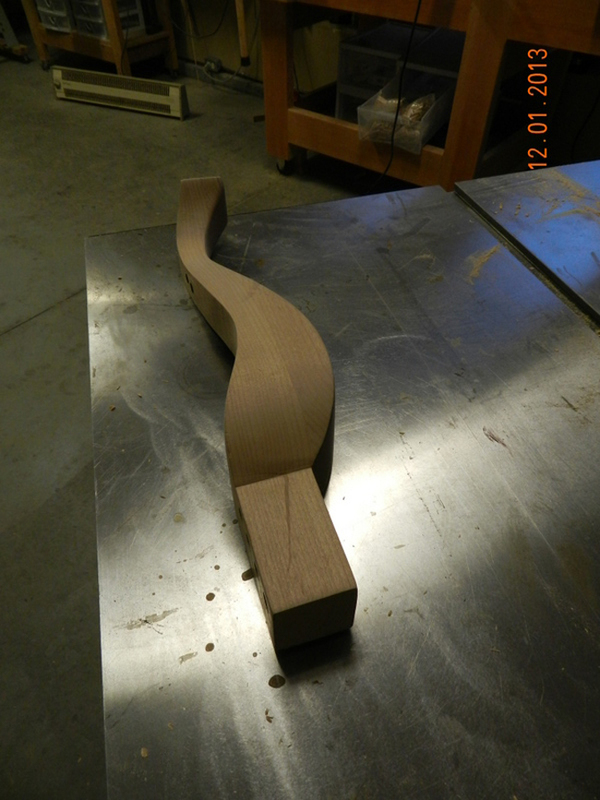 The rear legs are milled from full 2” x 4” x 38” material. 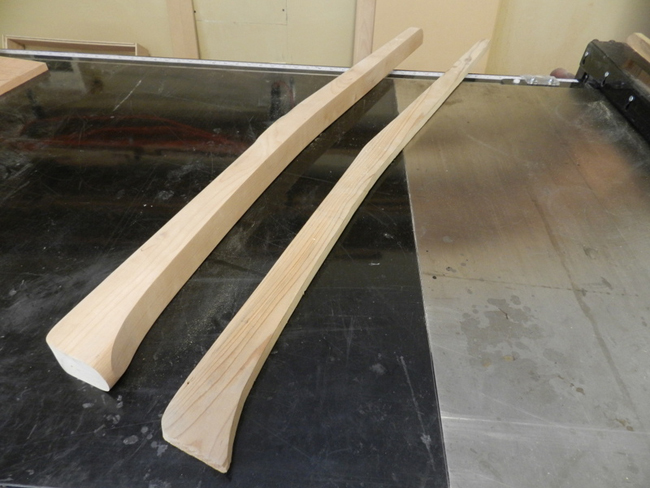 Mill width to 1 5/8” and use a shaped template to scribe desired profile. 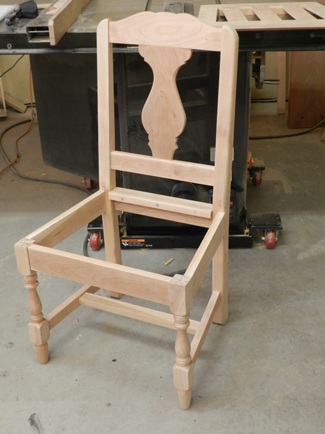 For this project I used the rear legs of a chair I had built several years ago (to the pre-gluing stage). Front face of back leg is angled 5 degrees from a position 18” above foot to top. 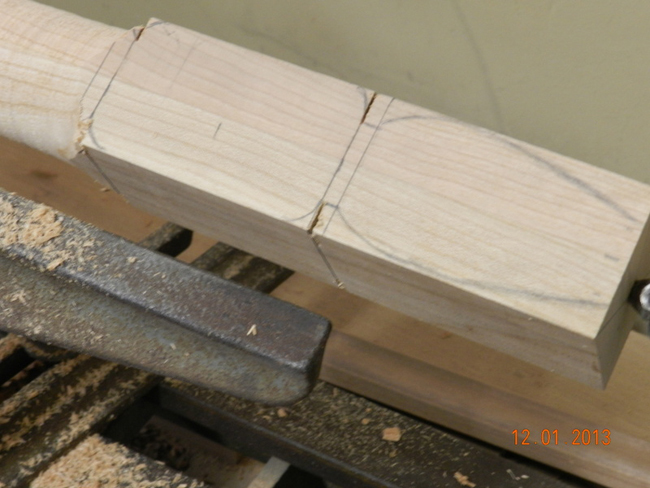 Cut rear profile using band saw. Sand round profile at heel. Top is radiused (approx. 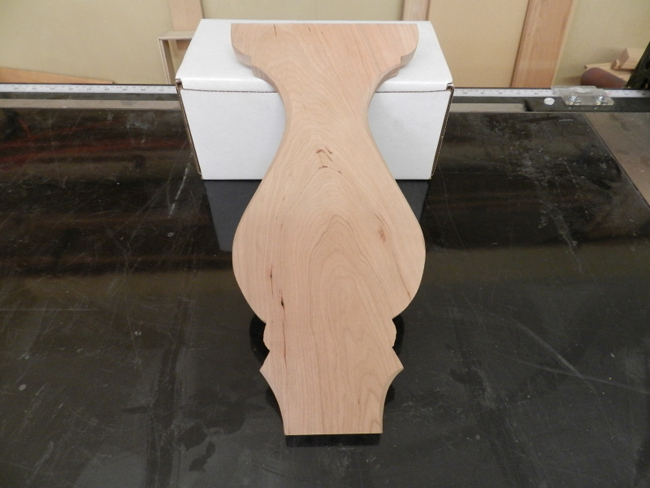 1 ½”) in band saw. *Route front outer edge leaving out section at seat rail joint. 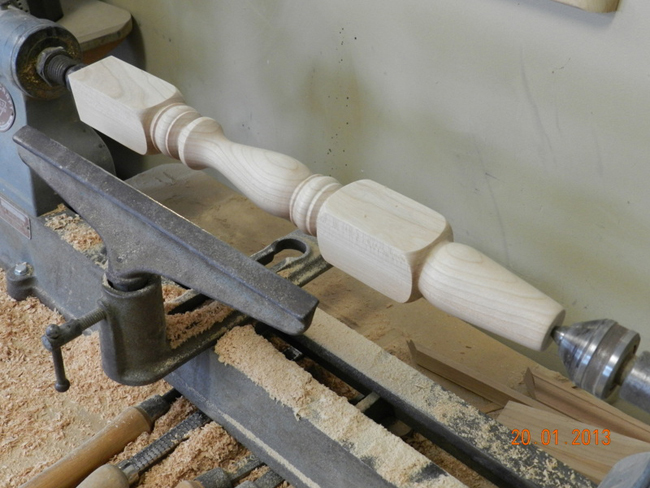 The next step is to mill the four rails joining the rear legs to front turned legs. The two top rails (forming the seat) are designed to accept 4 dowels. This, in my humble opinion, is one of the most stressed joints in furniture construction. On a comparative basis, this joint will be about 25% to 30% stronger than a mortise and tenon. This is our guarantee! The design incorporates an angled or flared front section. So the ends of all four rails are sectioned at a 6 degree angle. NOTE: with each rail, the angle at opposing ends is parallel. 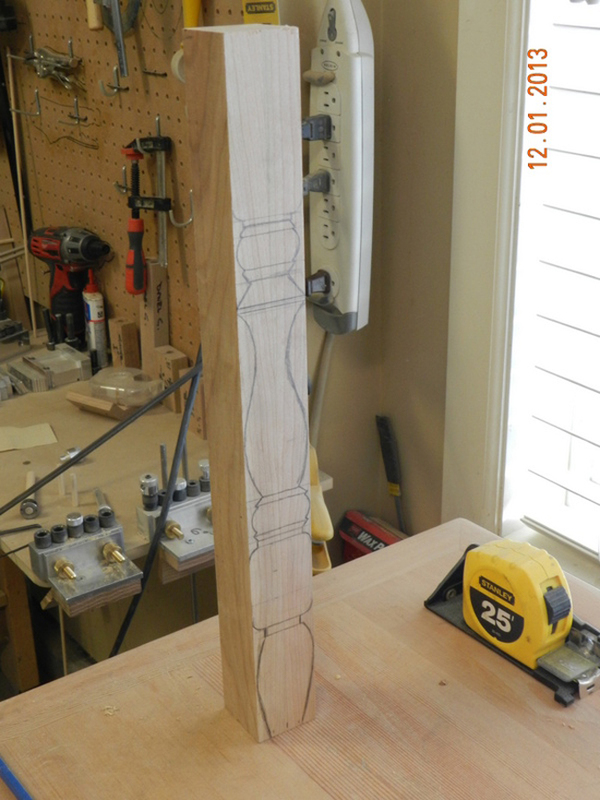 The next step was to tackle the three rear rails, i.e. rear seat rail and two backrest rails. The rear seat rail is 7/8’ x 2 7/8” x 14”, interim rail 7/8” x 2 1/8” x 14”, and upper rail 7/8” x 3 ¾” x 14. I designed the top rail then made a template. The template is cut to shape one half of the design, then rotated 180 degrees to shape the other half, that way both sides will be identical. 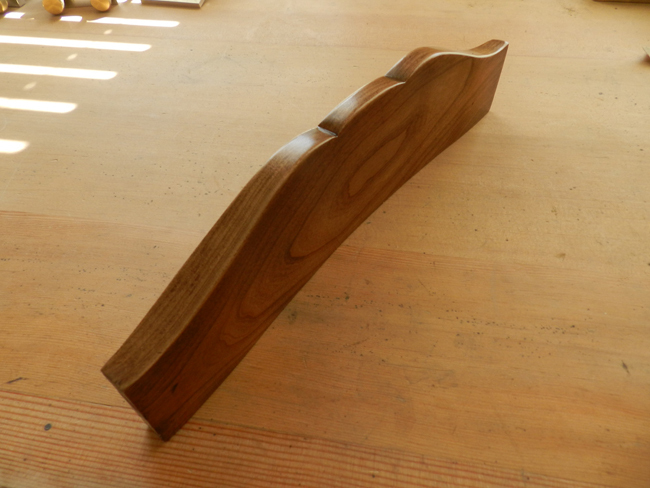 The upper rail or backrest also has curvature at the forward and rear faces. I wanted to avoid using 2” stock for this rail, attempted it with 1” material, and was very pleased with the result. Again I used one of my unconventional methods to scribe the curvature. Unconventional – yes, successful – yes! What is required is a large radius, in this case 46 3/4”. 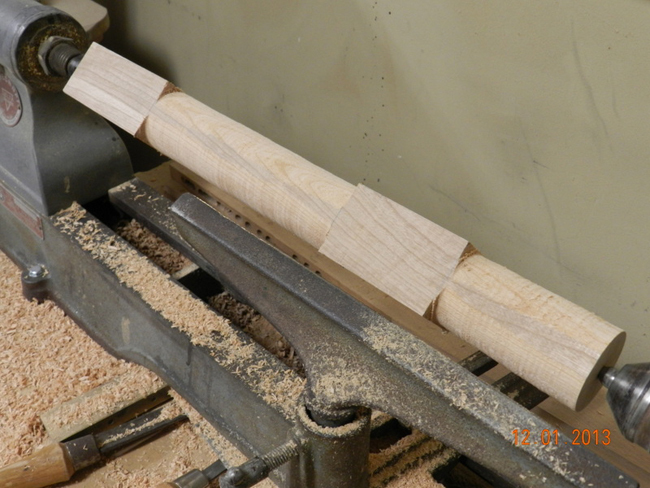 I used a long batten with pivot and pencil (see photo). Centre everything, then after completing the first curved line, move the pivot approximately 1” in order to complete the second line. 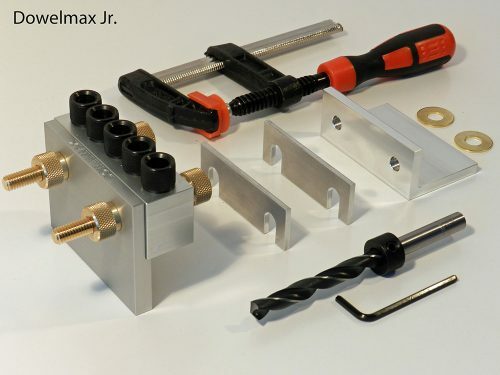 When cutting the profiles in the band saw, and in order to keep the work piece vertical, use a second similar sized work piece, lightly clamped to the rail. I cut a cardboard template for shaping the vertical backrest. Once again I shaped one half, then rotated the template to scribe the opposite profile. Before cutting the profile using the bandsaw, cut the backrest into the approximately rectangular form, absolutely square and true ½” x 6 ½” x 13 ¼”. Then dry fit the rear assembly including all rails. Now trim and fit the backrest to fit snugly between the intermediate and upper rails (this would have been very difficult if we had cut the shaped profile first). 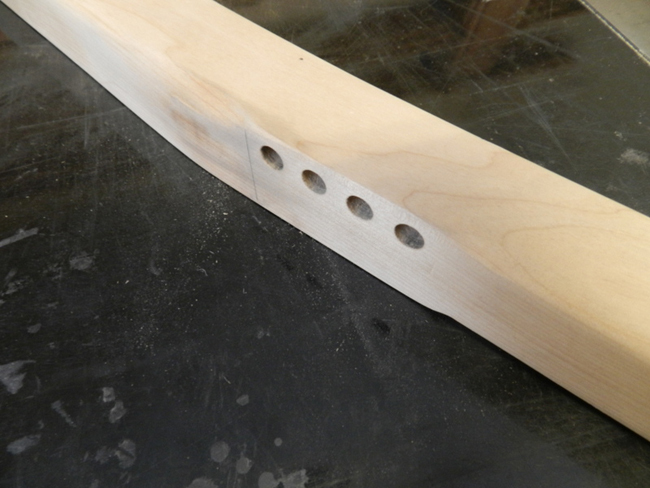 Cut and dress the backrest profile. Insert and centre the backrest between the two rails and scribe five lines at the junctions between backrest and rails. These are the upper and lower reference points. The upper rail has curvature at the forward face, so in this case, in order to simplify matters, we reference from the rear, using the scribed reference marks. 5 – ¼ inch dowels were used at the upper joint in conjunction with the indexing pin and 3 – ¼ inch dowels at the lower joint. 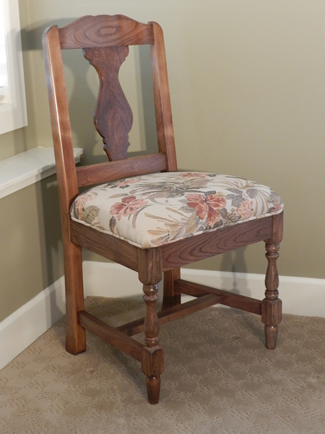 My preference is to completely dismantle the dry fitted chair and then prepare, stain and finish the various components separately. 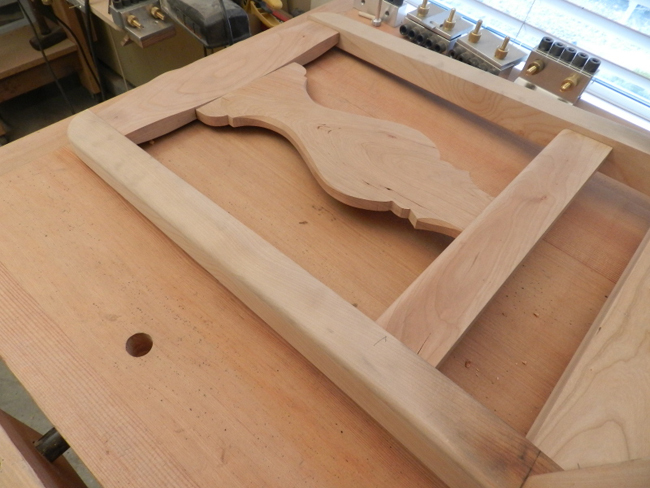 All pieces are sanded progressively 150 – 220 – 400 grit. The only wood I have found which does not need to be pre-treated (before stain application) is oak. The cherry I am using requires surface treatment to prevent blotching. I mix 3 parts methyl hydrate to 1 part shellac. Then apply mixture to each face using a small paint brush and cloth. Work with the grain. I left the pieces overnight, then applied the stain. I wanted a deep rich dark tone so I mixed one part gel espresso with 3 parts dark walnut. Again, I left the completed pieces overnight, then applied a second coat.